I've talked about The Iconfactory's commitment to Twitterrific before, as I think they're showing how a third-party Twitter client can keep up with new features while still adding its own flair and powerful features. 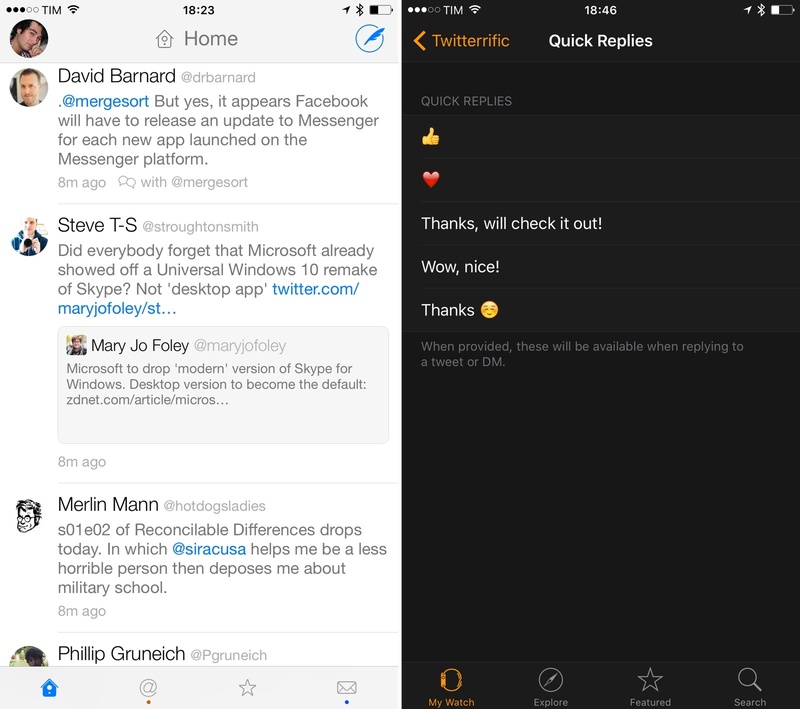 Today, The Iconfactory has released version 5.12 of Twitterrific for iOS, and I'm a fan of the changes. On the iPhone, there's a new setting to move the tab bar to the bottom and display an extra icon slot in it, including a new My Tweets timeline. In my coverage of Twitter clients last year, I noted how the app's top-oriented design didn't work well with taller iPhones as it often forced me to use Reachability to quickly get to those buttons. The ability to switch to a bottom tab bar makes Twitterrific more comfortable to use, which I believe is essential in a Twitter client I open several times a day. The option to show a timeline of your own tweets is another welcome improvement as I regularly want to check on replies and faves to my tweets (ego boost, I know). The other notable addition in this release is support for Twitter's new quote feature. Whenever a link to a tweet is included in a tweet displayed in the app, it'll be previewed inline with text and profile pictures. As I noted when this feature first rolled out on Twitter for iPhone, contextually quoted tweets are easier to read and require less taps to navigate between views. Quoted tweets are available in Twitterrific for iPhone and iPad, and I like their visual appearance. There are several other features I appreciate in this release. On Apple Watch, performance has been improved and you can now set your own custom replies – if you find yourself often replying with the same sentence or emoji over and over, Twitterrific now makes it easy to configure default replies that are only two taps away on your wrist. There are new banners for in-app notifications, which you can quickly dismiss with a swipe and that are useful and don't get in the way. And, you can now share muffle rules with other users; I've always liked this feature in Tweetbot, and now Twitterrific's muffling system (which has been vastly improved over the past few months) can be shared publicly, which is handy if you want to mute certain tweets but don't know how to create the rule yourself. The future of Twitter may be in the native app, but The Iconfactory continues to show how third-party clients can bring unique features and details that Twitter doesn't care about (Twitter's lack of share sheets and Apple Watch app are fairly ridiculous, for different reasons). Twitterrific has built a solid ecosystem of apps across the iPhone, iPad, and Apple Watch, and The Iconfactory iterates quickly and tastefully. Twitterrific 5.12 is available on the App Store.